Amongst Mobb Deep's younger fans, many probably wonder who Big Noyd is and why when Prodigy and Havoc are around, he's never far behind. They likely weren't around in the mid-1990s, when Noyd had electrified audiences with his scene-stealing performance on Mobb Deep's single ''Give Up the Goods'' from their landmark The Infamous LP. That helped build the buzz for his debut album Episodes of a Hustla. 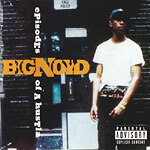 Released on Tommy Boy Records in 1996, the album is produced exclusively by Havoc and features four guest appearances by Prodigy. Considered one of the classic examples of the Queensbridge style epitomized by artists like Tragedy, Cormega and Mobb Deep themselves, Episodes of a Hustla features dark, haunting beats and vivid lyrical depictions of life in the projects of New York City during the Guiliani Era. Stand-out tracks include ''Recognize & Realize (Part I),'' ''It's on You'' and ''Usual Suspect.'' Traffic Entertainment is proud to present Big Noyd's Episodes of a Hustla in a new digipak edition.